UPDATED: Sat., Feb. 9, 2019, 10:37 p.m.
Killian Tillie is expected to miss at least the rest of the regular season with a partially torn ligament in his right foot. The junior forward was injured during the second half of Thursday night’s San Francisco game. Tillie’s injury will not require surgery, according to a Gonzaga release. It’s been a tough season for Tillie, who was sidelined for the first two months following surgery to repair a stress fracture in his right ankle. Tillie was still working his way back to his 2018 form as the third big in the rotation behind starters Rui Hachimura and Brandon Clarke. The 6-foot-10 native of France is a proven 3-point shooter with a soft touch around the basket. He has experience playing in most of the Gonzaga’s biggest games in 2017 and 2018. 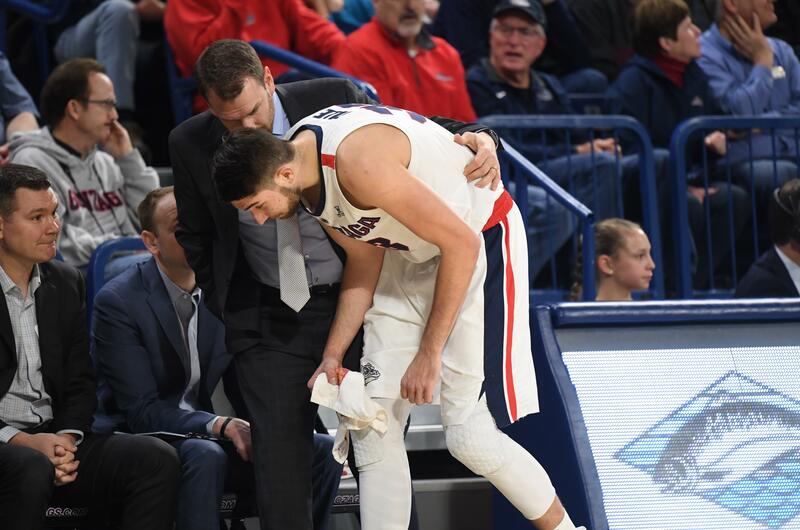 Tillie’s injury is a big blow to the fourth-ranked Zags’ frontcourt depth. His absence reopens the door for 6-11 freshman Filip Petrusev, who served as the third big with Tillie on the sidelines. Petrusev had seven games in double figures and averaged 8.5 points, 3.6 rebounds and 14.9 minutes in the first 15 games. His playing time has dropped to 6.3 minutes per game in WCC games. Jeremy Jones has been solid off the bench, and the 6-7 senior can play frontcourt or backcourt minutes. Tillie started 35 games last season and was projected to start this season before his ankle injury in October. He returned to the court on Jan. 5 against Santa Clara. He contributed 14 points in a road win over San Francisco and 10 points and six assists at Portland. Tillie is averaging 6 points and 4.2 rebounds in 17.2 minutes per game. Tillie was the most outstanding player in the WCC Tournament and an All-WCC second-team selection last season. He was the team’s top 3-point shooter at 47.8 percent, including a 13-of-14 stretch at the conference tournament. He averaged 12.9 points and 5.9 rebounds last season and 4.2 points and 3.2 boards as a reserve in 2017. Published: Feb. 9, 2019, 6:18 p.m. Updated: Feb. 9, 2019, 10:37 p.m.